Hey everyone, please vote, then leave a comment below letting me know which one of my planners you’d like to win (2016 Everyday Planner, UNplan Planner Pages or Project Life Planner Pages) by March 3rd and I will randomly draw one winner and announce on March 4th! Thanks so much, I appreciate your input! P.S. Don’t forget to enter my Spring 2016 NEW Releases for Lawn Fawn + GIVEAWAYS post while you are here! I would love to win the Unplanner in half size! Thanks for the opportunity! I would love to win on of your planners!!! I love the 2016 Everyday Planner!!! I have to say that I really love the full size sheets. I like the fact that I can incorporate photos into my monthly and weekly planning and other snippets that there really is no room for in the smaller planners. Thank you for the Giveaway! SevenNine! Actually. I love them all. Thanks for a chance to win! I would love the planner! I really like the letter size. I would love the Everyday planner 2016. Thank you! Mainly, I prefer the half-letter size just for versatility reasons. It gives you the most room to write and keep track of things without being too large to carry with you. Also, I’m a love-to-DIY type of person, so this also makes the half letter the easiest to print and cut at home. Otherwise, the 7 1/4 x 9 1/4 is my second favorite because EC is a girl after my own heart. That is my main day to day planner and I use the half letter for my homeschooling and home management binders. I would love to add the UNplanner to my collection because it’s something that I can re-use and re-purpose for multiple things and for years to come! Love your designs and your work. I’m on my third year at least of your products! I voted. I’d love the Every Day planner and prefer the 8.5 x 11 size, although I’ll be thrilled with any of your designs in any size. Thanks for the chance! Have a sparkle-riffic day! Hi! I love the unplanner planner and could definitely put it to good use!! Voted for the 5.5 x 8.5 – I love all your planners! Hi Tina! Awesome question…I was curious to see how popular the size(s) that I use are, still are or were lol! 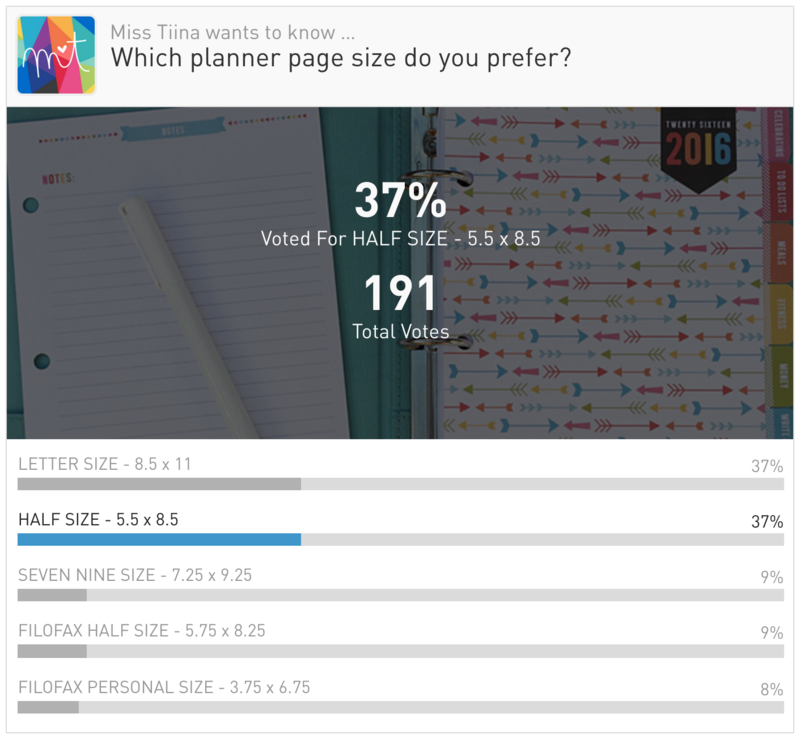 I voted for the personal planner size, but I have to differentiate between my home “binder” and personal planner. I don’t use the same system for these and although I have your ’14 & ’15 Everyday Planner in the Personal Size, I use that for my main household binder/organization. For everyday use, I use 5.5 x 8.5. Sooo, I’d absolutely LOVE to check out and print the new personal use Project Life Planner! Any plans to incorporate the new templates as add-on purchases at all (i.e. big shots)? I love the Every Day Planner. If I win I would like the Project Life planner. I already love your dated planner and would like to try a new one. I would love to win the Project Life Planner Pages in the half siz-already have the UNplan pages and love them! Thanks so much for the opportunity to win! I voted for the half size. The planner I prefer is the Unplan Planner Pages. Thanks again! Wow! Tough choice, but I guess I have to say the Unplan Planner! But they’re all so cute and helpful in their own ways. I love love love half sizes! They have to go every where with me and my 4 kids!! Hiya! Just entered the poll. I would prefer the half planner size to add to your other fabulous sheets that I have! I’d like to win the unplanned planner pages. I do not have a planner or use one as yet. Been looking at them. They all look amazing. Thanks for this great give away! I’d love to win the Unplan planner pages! I’d love the 7.25 x 9.25 – – that goes best with my current scheme of things. Thanks for the opportunity. I would LOVE any if your planners! I think the UNplannner is my favorite tho! Thanks for doing this giveaway! You’re awesome! I think the UNplanner is awesome. I could use it for my scrapbooking AND family history projects. Thanks!!! The UNPlan Planner pages in half-size looks like it would be great! Thanks for the chance to win! The 2016 Everyday Planner in half size would be lovely. I have your Everyday Planner from last year and LOVE it!!!!!! Thank you for the chance to win! I like the 8 1/2 x 11. Love your planner pages! I have used both full page and half page. I absolutely love the rainbow colors. Hey Meg, I’ve updated almost all of my freebies to included all 5 sizes now if you want to re-download! I already purchased your 2016 calendar (as well as the last 2 years!) I love your calendars! I would love the unplan planner in the 5.5 x 8.5. I love all of your things! I would love to win the UNplanner planner pages! The UnPlan Planner. I think the versatility of it is amazing and exactly what I’m looking for in a planner!! I love your 2016 Everyday Planner! It is perfect!